In this article, we are going to talk about images, their types and some basic functions for Images. This article is part of our MATLAB tutorial series,Â which we are developing for Image processing through MATLAB. We expect you to give us feedback, so that we can keep the information flow more efficient, informative and up to the mark. In the first chapter, you have learned an introduction to MATLAB and its commands. In this chapter you will learn how to represent different types of images in MATLAB. In addition you will learn how to read & display images in MATLAB and how to create an M file. Technically whatever we categorize as a picture, is an Image. We already talked about the basics of Image processing in our first article, we would focus today on technical representation of images. 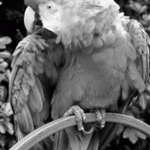 Grayscale Image: InÂ dailyÂ languageÂ whatÂ weÂ referÂ toÂ asÂ black-and-whiteÂ (asÂ inÂ oldÂ photos)Â areÂ actually grayscale. It contains intensity values ranging from a minimum (depicting absolute black) to a maximum (depicting absolute white) and in between varying shades of gray. Typically, this range is between 0 and 255. Color Image: We all have seen this! Such an image is composed of the three primary colors, Red, Green and Blue, hence also called an RGB image. RGB Â value: Â All Â colors Â which Â we Â see Â around Â us Â can Â be Â made Â by Â adding Â red, Â blue Â and Â green components in varying proportions. Hence, any color of the world can uniquely be described by its RGB value, which stands for Red, Blue and Green values. This triplet has each value ranging from 0 to 255, Â with Â 0Â obviously Â meaning Â no component Â of Â that particular Â color and Â 255 Â meaning Â full component. For example, pure red color has RGB value [255 0 0], pure white has [255 255 255], pure black has [0 0 0] and Â has RGB value [55 162 170]. An image in MATLAB is stored as a 2D matrix (of size mxn) whereÂ each elementÂ of the matrix represents the intensity of light/color of that particular pixel. Hence, for a binary image, the value of each element of the matrix is either 0 or 1 and for a grayscale image each value lies between 0 and 255. A color image is stored as an mxnx3 matrix where each element is the RGB value of that particular pixel (hence itâ€™s a 3D matrix). You can consider it as three 2D matrices for red, green and blue intensities. imread(): To read an image and store in a matrix. It is alwaysÂ advisedÂ to use a semi-colonÂ (;)Â atÂ the endÂ of theÂ statementÂ of readingÂ anÂ image, otherwiseâ€¦ you can try yourself what happens! You try out making many different types of images like this just to make yourself comfortable with the commands learnt till now. Data cursor: To see the values of the colors in the figure window, go to Tools>Data Cursor (or select from the toolbar), and click over any point in the image. You can see the RGB values of the pixel at location (X,Y). And see the pixel info on lower left corner as you move mouse pointer over different pixels. Now, before we move on to our next article, we take a little detour in this article and talk about some MATLAB resources which will be extensively be used in coming article. 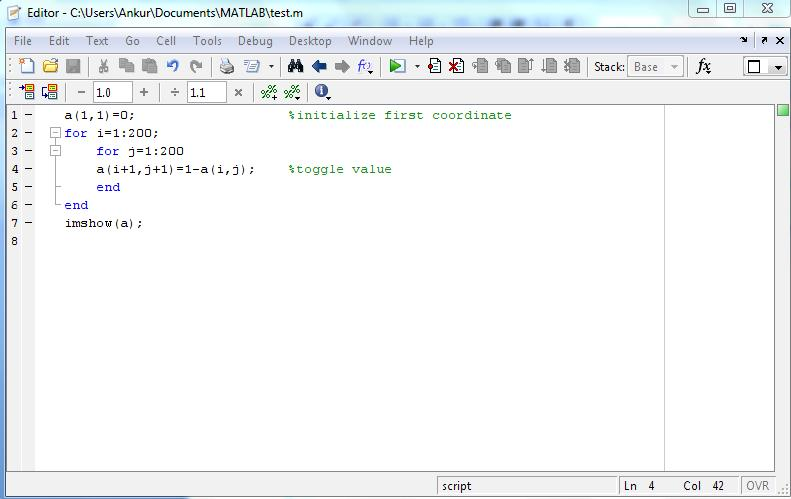 It is a provision in MATLAB where you can execute multiple commands using a single statement. Here the group of commands is stored as a MATLAB file (extension .m). And in MATLAB command window, all the above commands will execute. Comments: As we have comments in C/C++/ Java using double slash (//), in MATLAB we use symbolÂ %Â toÂ writeÂ comments,Â i.e.,Â statementsÂ thatÂ areÂ notÂ consideredÂ forÂ execution.Â You can see comments in green in the snapshot above. Functions,Â asÂ someÂ ofÂ you mightÂ know,Â areÂ writtenÂ to organizeÂ theÂ codeÂ efficientlyÂ andÂ make debugging easier. The set of statements within a function can be executed as and when required by just calling it, thereby avoiding repetitions. The data which is needed within the function can be passed as arguments and then the required values can be returned.Â You can return any no. of values and they can be matrices also. Â We value your suggestions and feedback very much. Please drop by your comments. This encourages us to move forward! Until next article is up this all folks! Keep reading and keep learning.